The Half Marathon begins at 7:30 AM. Runners and walkers are welcome! The course is on partially closed roads and will be open for 4 hours. During this time, you'll have full support from our medical team, volunteers, flaggers, and police officers. After 4 hours, you'll be instructed to follow the normal rules of the road as the streets will be open to the public. The run begins and ends at Horseshoe Lake, just west of I-5 at exit 21. From Horseshoe Lake, you'll head south around the open part of the lake's horseshoe and then around the lake towards the historic Hulda Klager Lilac Gardens. 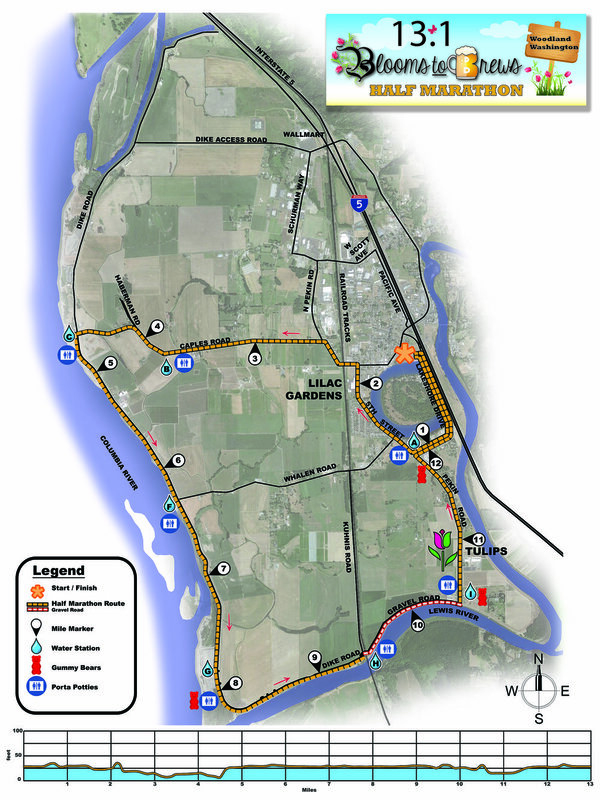 Enjoy spectacular views of the Columbia River for the next three miles until the road curves to the northeast to follow the north fork of the Lewis River. After another two miles you'll cross the dike. Be very careful of your step as you follow the gravel dike for three-quarters of a mile. Upon crossing the dike, the sight of Holland America Bulb Farm's fields upon fields of colorful tulips will take your breath away. Enjoy the beauty of spring in the air as you run past the tulips and continue to the finish line near Horseshoe Lake to relax with a refreshing micro-brew. With registration, all runners and walkers receive a finishers medal, dri-fit shirt, chip timing, virtual goodie bag, food, a beer, and DJ at the post-party! There are also overall and age group awards!